The current price is 31850 Euro. 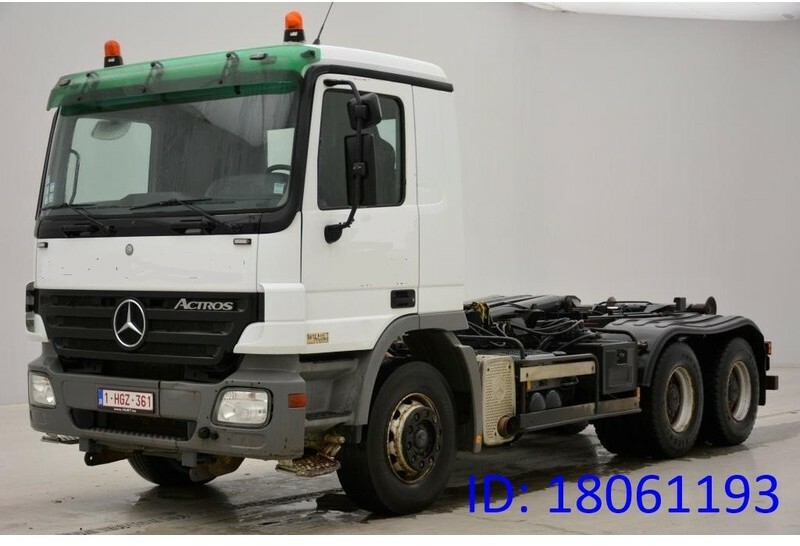 The detailed specification of MERCEDES-BENZ Actros hook lift truck is provided below. offers excellent transport solutions for business and individual needs. The year of production is 2005. The details on engine output, gearbox and emission class are as follows: Euro 3, diesel, engine cylinders: 6, 410 hp, differential lock, gearbox: automatic, transmission: Halbautomatisches Getriebe, ASR. Wheel formula and suspension type: suspension: spring, front axle suspension, 6x4, number of axles: 3, wheel base: 3900 mm, brakes: drum, ABS, front tires: 315/80R22.5, 10%, rear tires: Achse 1: 315/80R22.5, 10% / Achse 2: 315/80R22.5, 10%, dual wheels, trailer coupling. Cab comforts include cab type: day cab, cab model: Actros, sunvisor, power windows, electric mirrors, air conditioner, cruise control, board computer. Exterior measurements: length – 7900, width – 2550, height – 3300. The mileage is 539544 km. The parking site is in BE, Belgium. Our customers’ satisfaction has always been our top priority.